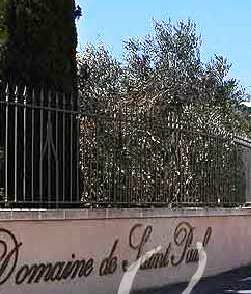 Domaine de Saint Paul was first established in the Chateauneuf du Pape appellation in 1934. In 1958 a new era for the property began when it was purchased by the Establet family. The Establet family have a long history in the Chateauneuf du Pape appellation as they can trace their roots all the way back to the 14th century. The daughter of Charles Establet married Pierre Jeune, which is how the property came to be owned by the Jeune family today. The Jeune family has been in the Chateauneuf du Pape region almost as long. In fact, the Jeune family has a history in the Southern Rhone Valley that dates back hundreds of years. Domaine de Saint Paul was one of the first efforts for the Jeune family as wine makers in the Southern Rhone. They expanded their holdings in 1972 when they purchased Domaine du Grand Tinel. Domaine de Saint Paul remains in the hands of the Jeune family today. Domaine de Saint Paul owns 14.8 hectares in Chateauneuf du Pape. 14.5 of those hectares are used for the production of red Chateauneuf du Pape wine. The other .3 hectares are used to plant grapes for the production of Chateauneuf du Pape Blanc. The vines are mostly planted in a terroir with gravel, clay and rocks with some limestone. To produce the wine of Domaine de Saint Paul, the grapes are completely destemmed. Vinification takes place in a combination of oak barrels and stainless steel vats. All the grapes are 100% destemmed. The vineyards are farmed using sustainable farming, biodynamic techniques. In 2012, they were certified as 100% biodynamic by the Agriculture Biologique. Philippe Cambie is the consultant at Domaine de Saint Paul as well as at their sister property, Domaine du Grand Tinel. Domaine de Saint Paul produces 3 red Chateauneuf du Pape wines and one Chateauneuf du Pape Blanc. Domaine de Saint Paul Chateauneuf du Pape – 80% Grenache, 15% Syrah, 3% Muscardin and 2% Cinsault. Although the blend can vary quite a bit from vintage to vintage. The average of the vines for this wine are close to 50 years. The terroir is mostly rocks, stones and sand. The Grenache and other varietals are aged in cement vats. The Syrah is aged in foudres for about 11 months. The production is about 1,250 cases per year. Domaine de Saint Paul Insolite – The wine made its debut with the 2013 vintage. The wine is one of the few Southern Rhone wines made from 100% Syrah. The vines are planted in the Le Boucoup, and Pied Redon lieux-dits. The terroir is all rocks and stones. The wine is aged in demi-muids and old, used, French, oak barrels. Domaine de Saint Paul Cuvee Jumille – 60% old vine Grenache and 40% Syrah. The Grenache is aged in cement tanks. The Syrah is aged in demi-muids for about 11 months. 500 cases are produced each vintage. Domaine de Saint Paul Chateauneuf du Pape Blanc – 50% Grenache Blanc and 50% Roussanne. 100 cases are produced each year. Domaine de Saint Paul can be enjoyed on the young side. Young vintages can be popped and poured, or decanted for about 1 hour, give or take. This allows the wine to soften and open its perfume. Older vintages might need very little decanting, just enough to remove the sediment. Domaine de Saint Paul is usually better with 2-4 years of bottle age. Of course that can vary slightly, depending on the vintage. In the best vintages the wine should be consumed within 3-12 years after the vintage. Domaine de Saint Paul is best served at 15.5 degrees Celsius, 60 degrees Fahrenheit. The cool, almost cellar temperature gives the wine more freshness and lift. Domaine de Saint Paul is best served with all types of classic meat dishes, veal, pork, beef, lamb, duck, game, roast chicken, roasted, braised, stewed dishes, sausage, barbecue and cassoulet. Domaine de Saint Paul is also good with Asian dishes, hearty fish courses like tuna, mushrooms, cheese, pasta, eggplant and tomatoes. The white wine of Domaine de Saint Paul is best served with a myriad of different seafood dishes, shellfish, crab, lobster, sushi, sashimi, chicken, pork and veal, as well as Asian cuisine. Smoke, old wood, burning leaves, barnyard, spice and dark, meaty red fruits emerge in the glass with a bit of swirling. On the palate, the wine has power, concentration and a full body. The tannins are gentle. There is an iron quality to the dark red fruits. Give this time in the bottle and it should be even more complex. Made from 100% Syrah, this is an interesting wine to taste, as there are only a handful of Chateauneuf du Pape wines made using only Syrah. Garrigue, under brush and cherries blend perfectly here. Medium bodied, fresh, and with juicy dark cherry notes in the finish, you can drink this young, for all its sweetness and spicy, peppery fruits. The wine was made from 70% Grenache and 30% Mourvedre. Dark, spicy and deep, the wine is rich, stony and fresh. Full bodied and intense, there is a peppery accent to the red berries and lift giving this a freshness from start to finish. Made from 100% Syrah, this is an interesting wine to taste, as there are only a handful of Chateauneuf du Pape wines made with only Syrah. With a strong Provencal, herbal charm, the wine is medium bodied, fresh and forward. Dominated by kirsch and red plums the wine should offer its sweet. spicy, red fruits with ease on release. The wine was made blending 70% Grenache and 30% Syrah. The second vintage for this unique 100% Syrah. Peppery, spicy, stony and tannic, this is going to need time to soften its tannins and allow all of its smoky, red fruits and oak to come together. Jammy black cherries and licorice form the basis of the sweet, fresh, medium bodied, forward, polished wine. You should drink this on the young side. Making its debut, this is one of the few Chateauneuf du Pape wines, made from 100% Syrah. With a touch of oak in the nose, coupled with pepper, smoke and black raspberries, the wine spicy, fresh and round, especially when you consider it's made exclusively from Syrah. Jammy black cherries and licorice form the basis of the sweet, fresh, polished wine. Produced from a blend of 75%Grenache, 20% Syrah and 5% Cinsault, the wine reached 15% alcohol. Medium bodied, forward, finesse in style with good freshness and textures in its delicate, cherry finish. Filled with fresh herbs, pepper and soft textured, spicy berries, this elegant, refined Southern Rhone and finishes with sweet red berries. Spicy ripe berries, fleshy textures and a sweet, jammy berry finish are found in this wine. Medium bodied and probably close to fully mature, the wine focuses on the red fruit side of the style range with wild strawberry and kirsch notes out in full force. The wine is fresh, spicy and elegantly styled. This does not require decanting. Just pop and pour.